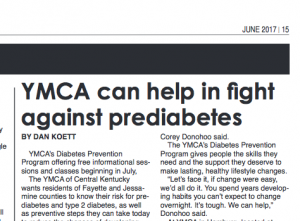 The YMCA of Central Kentucky wants residents of Fayette and Jessamine counties to know their risk for prediabetes and type 2 diabetes, as well as preventive steps they can take today to reduce the chances of developing the disease. 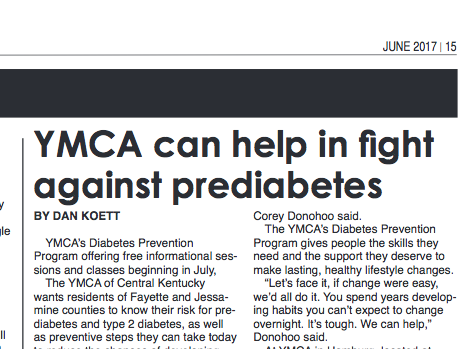 In July, the YMCA will be offering two free informational sessions for individuals to come learn about the YMCA’s Diabetes Prevention Program and see if they qualify. “Studies show that people with prediabetes can prevent or delay the onset of type 2 diabetes by making simple lifestyle changes that include eating healthier and increasing physical activity,” Director of Community Health Corey Donohoo said. The YMCA’s Diabetes Prevention Program gives people the skills they need and the support they deserve to make lasting, healthy lifestyle changes. “Let’s face it, if change were easy, we’d all do it. You spend years developing habits you can’t expect to change overnight. It’s tough. 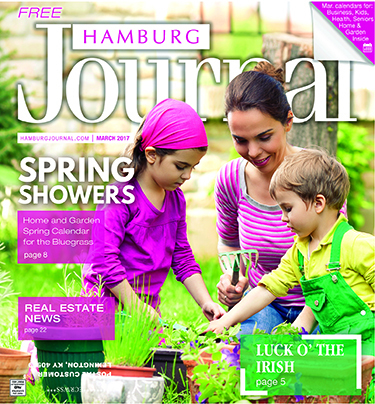 We can help,” Donohoo said. At YMCA in Hamburg, located at 2681 Old Rosebud Road, classes will begin Tuesday, July 25 at 6 p.m. for those who qualify. The program is open to all individuals through the Y regardless of their insurance status or their Y membership status. To participate in the program, you must be 18 years or older, overweight owitha body mass index of over 25, and diagnosed with prediabetes via one of three blood tests or previous diagnosis of gestational disease. Each participant in the program receives a free YMCA membership throughout the duration of the program. To learn more about the program, visit ymcacky.org/diabetes or contact Director of Community Health Corey Donohoo at 859.367.367.7317 or email communityhealth@ymcacky.org.